Nothing is quite as cozy as a crackling fire in a fireplace – especially on a day like today when the high temperature is expected to be 8º and the windchill -25º. A fireplace ranks in the top three desired features home buyers look for, with about half indicating they would be willing to pay extra for a home with a fireplace. According to the National Center for Real Estate Research, a fireplace adds nearly 12% to the value of the home. Today about 60% of new homes have a fireplace, which is up from 36% in the 1970s. And outdoor fireplaces and firepits are being installed in record numbers. St. Louis is sometimes referred to as “brick city” because of the abundance of brick homes and fireplaces. Many of our historic homes have decorative fireplaces that may not provide heat, but still lend a sense of warmth and comfort. If you don’t have a fireplace, we’re providing lots of photos to warm you up in this frigid weather, along with some information on different types of fireplaces. The gallery above highlights some favorite fireplaces from our listings over the last couple of years. Below are some other swoon-worthy favorites. Grab a cup of hot tea, coffee, or cocoa and enjoy our fireplace roundup! A traditional wood-burning hearth is what most people think of when they picture a fireplace in their head. Traditional open hearth fireplaces are typically made of stone are brick and when you are close to them, you can really fell the heat. They often are not as effective at heating rooms as some of the more modern varieties. Enclosed fireplaces feature a large glass panel that allows you to see the fire as it burns and has less heat escaping up the chimney and more entering the room. Fireplace inserts are made to fit in existing fireplaces and turn an inefficient open hearth heating system into one that is more fuel efficient and effective. Finally, there are wood burning stoves, that although not technically a fireplace, are an alternative. 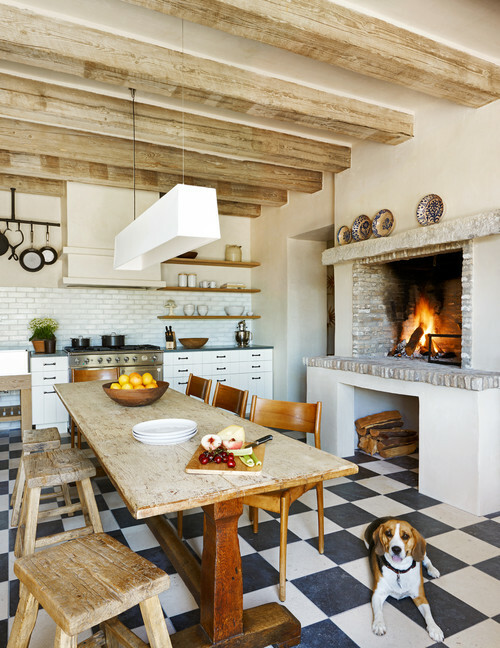 This kitchen blends modern and traditional features with a wood burning fireplace. Although they may not offer the same feel as wood burning versions, fireplaces that use gas burn more cleanly and typically create more heat for a lower cost. They can also require less construction or reconstruction to install. The direct-vent style vents through an existing or newly constructed chimney, however, you can alternatively use a pipe so that fewer changes in the house’s structure are necessary and it can be installed in any room. Some municipalities and insurance companies may not allow piped venting. Ventless built-in indoor fireplaces are the simplest to install as there is no need for a chimney or vent. Although every effort is made to keep them clean burning, it is possible that some contaminants will enter your home with the use of a ventless built-in fireplace. Fireplace insert in one of our 2017 listings in Tower Grove South. Ethanol burning fireplaces have become a trend for their ease in installation and contemporary design. They are clean and odorless and, perhaps best of all, they require minimal installation if any. They will probably not create as much heat as gas or enclosed wood-burning fireplaces, but they are more environmentally friendly. If you have an existing fireplace, you can get an ethanol burning insert that will slide right in, making use of the space and the current aesthetics. Wall mounted fireplaces allow you to actually hang your fireplace on any wall that you choose, making it double as both a heating source and a piece of art. Modern ethanol fireplace in a marble surround. Electric fireplaces are the cost-effective option out of all of the types of fireplaces on the market. As an added bonus, electric fireplaces are relatively easy to install. Another added benefit of electric fireplaces is that most of them enable you to turn the heating function on or off while maintaining a fireplace-like ambiance. Most electric fireplaces include a remote-controlled heater and some even have different varieties of fire effects, which allows total user customization. Wall mounted electric fireplaces are very popular and an eco-friendly option. Outdoor fireplaces or firepits typically offer similar fuel options as standard fireplaces – wood, propane, gel fuel, and natural gas. Before building an outdoor fireplace or pit, research your municipalities specific laws to save yourself time and hassle. Selecting the right location in your yard is crucial. Aim for some wind protection to minimize smoke and ash, build plenty far away from your home and low-hanging limbs. If you are DIY-ing a pit, make sure you know the location of the utility lines buried on your property to avoid damage. And if you are building a pt on pavement or patio stones, invest in fireblocks to protect the surface from the heat of the fire. Enjoy outdoor living at its best with a patio fireplace like this one at our coming soon listing at 3670 Flora Place in the historic Shaw neighborhood. One of our favorite features in mid-century homes are double-sided fireplaces. Painting brick or stone fireplaces is always controversial. White is the usual choice, although many are opting for moody treatments like charcoal gray or black. Our LaSalle rehab in Lafayette Square had four fireplaces. The master bedroom fireplace had an exquisite mirrored mantle. This tiled fireplace provides the perfect accompaniment to the artwork in this ecclectic South St. Louis home. These hanging/floating wood stoves are making a comeback. This one works well in a Scandinavian-inspired decor. Give us a call if you want to meet for a fireside chat about your real estate goals. We have a list of St. Louis spots with fireplaces where we can grab a coffee or drink. Stay warm!